Every homeowner with a remodeled kitchen knows that new appliances can take a big bite out of the budget. If you're looking for a wallet-friendly way to get the stainless steel look without the stainless steel price, we've got you covered. Stainless steel automatically free from dirt and grime, but it’s durability and beauty sure make it popular. It’s now the first choice for almost every kitchen appliance, from the humble microwave to the full-size fridge. Unfortunately, the popularity of this artful alloy is matched by a steep price tag—and, if you make the upgrade, the hassle of labor of disconnecting an old appliance and installing a newer model. These setbacks didn’t stop Julie Blanner from creating the kitchen of her dreams. 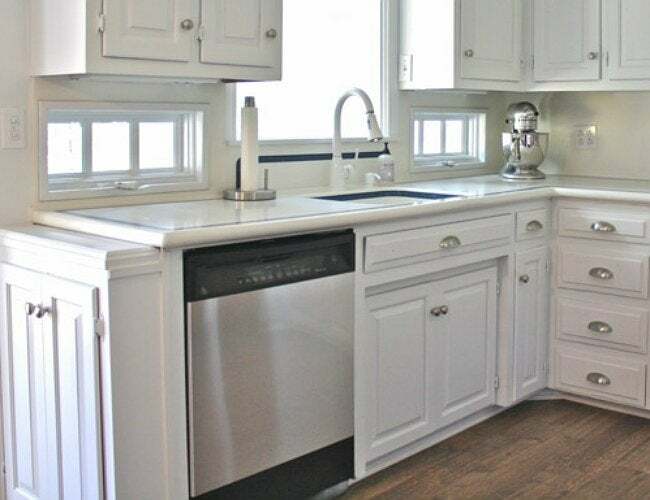 With a cheap roll of stainless steel contact paper and her trademark precision, the resourceful DIYer transformed an out-of-place black dishwasher into a stunning faux stainless steel appliance that both complemented her white cabinetry and saved her hundreds of dollars that she’d planned to spend on something new. Blanner’s solution is perfect for the fully functional appliance that it feels a waste to part with simply for aesthetic reasons. Although application wasn’t altogether painless, it was certainly easier than a hookup on a new dishwasher. Blanner cut a single sheet of the stainless steel paper about 3 inches larger in length and width than the door to her small dishwasher. Lining up the corner of steel paper with the top edge of the appliance, she simultaneously peeled away the backing and pressed the paper down with a credit card. The makeshift applicator made smoothing out bubbles a snap, leaving behind the pristine polish of a new stainless steel appliance. Looking to recreate the luxe look at home? Having a type-A personality helps, but all you really need is plenty of patience, time, and a teammate you trust. While Blanner applied the faux finish, her project partner held the steel paper taut to prevent creases. And don’t worry about messing it up: Even if you have an “oops” moment, you can always peel the contact paper back, reposition it, and get back to business.